I had some guests over for dinner & I thought it would be the perfect opportunity to try out a new recipe! 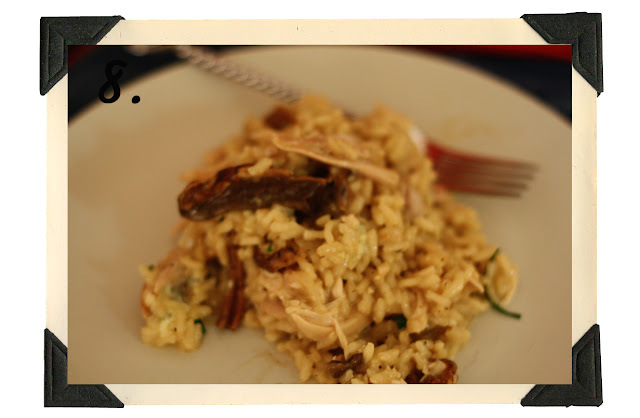 One of my guests had mentioned that they had never had risotto, & really wanted to try it. So that's what I made! I searched for some recipes on the Food Network website (my go-to place for recipes) & found something that looked super delicious. 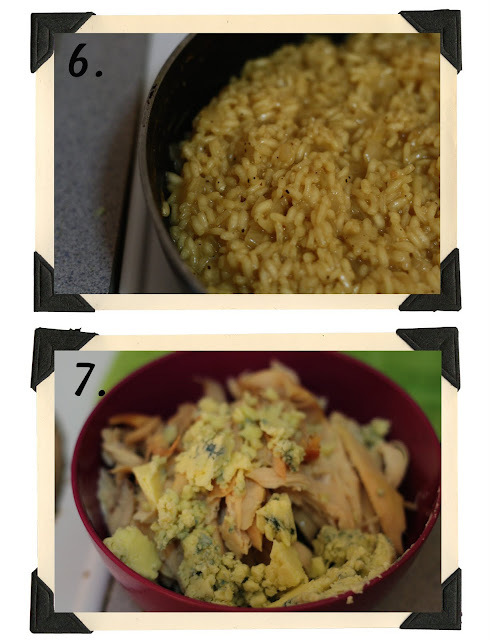 Gorgonzola and Porcini Mushroom Risotto, by Giada DeLaurentiis. She's also one of my go-to chefs for recipes, so this was s win-win in my book! 1. 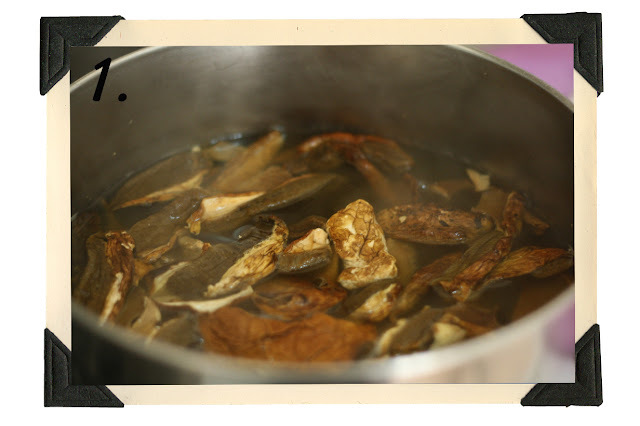 Bring 4 cups of chicken stock to a boil - Add the porcini mushrooms & let hydrate for about a half hour. Remove the mushrooms with a slotted spoon & set aside. 2. Chop a medium onion. 3 & 4. Saute the onion in 3tbs butter until soft (but not brown). 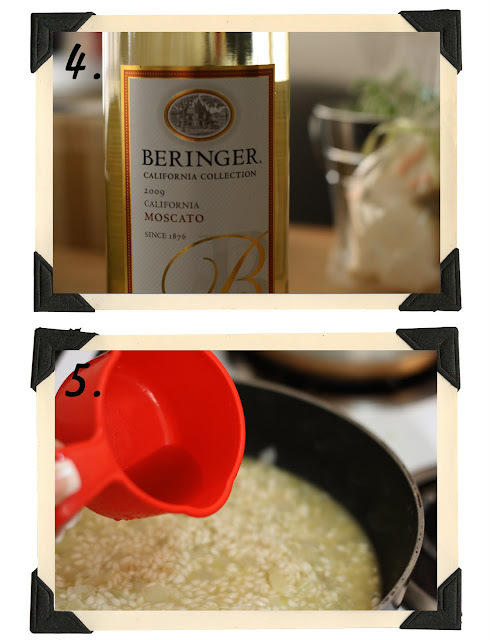 Add 1 1/2 cups Arborio rice & 1/2 cup white wine (I used a Moscato because I wanted a sweeter background flavor to the dish). Cook until wine has evaporated. 5. Add 1/2 cup of chicken stock to the rice. Wait until absorbed & continue adding 1/2 of chicken stock at a time, until you've used up all of the stock. 6. Add salt & pepper. This is what your rice will look like after it has absorbed all of the chicken stock. In the end, it turned out sooooo delicious. I'm definitely trying out more risotto recipes & changing up the veggies, meats & seasonings that I add to it! more wine never hurt anyone.. errrrrr, right? This looks SO yummy!! Need to try it soon! This looks so good. Mushrooms and white wine were just made to take a bath together. I love the mix of their flavors... and risotto isn't bad either! hi, i'm you're newest follower! you're blog is fun, so i couldn't resist!! ohhhh yummy!! this looks soo good!! i want to try it for sure!! 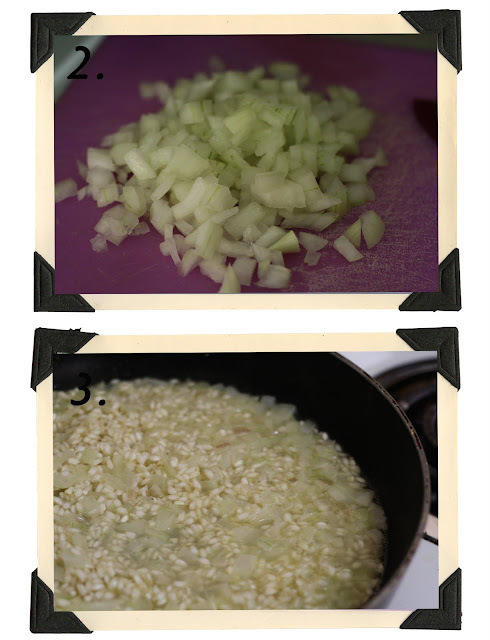 risotto has got to be one of my favorite things of all time, ever since I first heard the term on Gilmore Girls :). pugly pixel has such great overlays, but i have never tried them before!